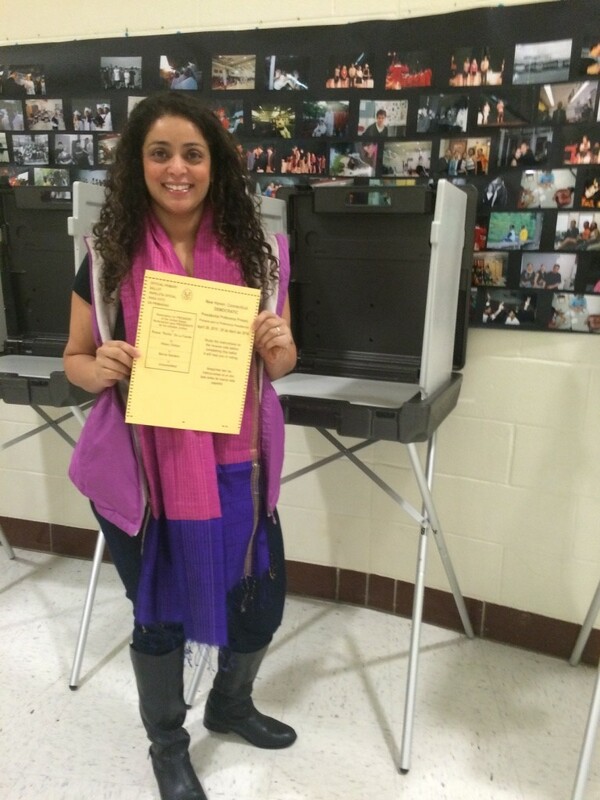 One new American and new voter, Sahar Usmani-Brown, with her ballot in New Haven on April 26. With the primary season and party conventions over, the general election looms in November. New Americans and young voters may play pivotal roles in certain states and Congressional districts. According to a Pew study, “An estimated 69.2 million Millennials (adults ages 18–35 in 2016) were voting-age U.S. citizens … 31% of the voting-eligible population.” Yet actual “young-adult turnout depends on … the candidates, the success of voter mobilization efforts,” and other issues. The same could be said regarding older voters, including those in “Generation X” (ages 36–51) — such as my wife (Sahar Usmani-Brown), who remained a citizen of India until January 2016. As a new U.S. citizen, she seized her first opportunity to vote April 26, when Connecticut held primaries. Our region resembles the nation at large. A basic knowledge of history and civics is important to involvement as a voter and, more broadly, as a citizen. Across the country, many of the new voters are also new citizens. In 2016, according to the Pew Research Center, 12 percent of the electorate is expected to be Hispanic. Latino/a voters (who are also disproportionately young) could make the difference in swing states such as Florida, Colorado, and Nevada. Latino/a immigrants and those from Muslim backgrounds are among the new voters. Some are even preparing to run for office themselves, for example through the New American Leaders Project. The Indian American voting population continues to grow substantially, albeit from a relatively low number in most states. (While it is hard to obtain much data on Indian American voters specifically, there is some information on the broader category of “Asian Americans and Pacific Islanders.”) The White House reports 16.6 million AAPIs (about 5.4% of the U.S. population) — “one of the fastest growing racial groups in the U.S.,” forecast to be nearly 10% of the population by 2050. According to June 2016 Census data, the U.S. “Asian population totaled 21 million as of July 1, 2015,” up 3.4 percent in a year, “due largely to net migration…. Asians were the fastest growing race group.” Further, “Those who identify as two or more races had a total population of 8.2 million, up 3.1 percent from 2014. This was the second-fastest growing race group … primarily due to natural increase.” Those identifying as two or more races “had the youngest median age,” at 20. WNPR’s Where We Live program recently devoted a segment to Asian Americans and “race, politics, and stereotyping,” including in Connecticut. As the program noted, three members of our state’s legislature are Asian Americans, one of whom — a Republican — was born in India. So far, two Indian Americans have been elected as state governors: “Bobby” Jindal in Louisiana and “Nikki” Haley in South Carolina; both are Republicans. An Indian American far to their left ideologically, Pramila Jayapal, is a candidate for Congress from the state of Washington. Also on the West Coast, a woman who is both Indian American and Jamaican American (her mother from India and her father from the Caribbean), Kamala Harris, has already been elected attorney general of California and is now a candidate for the U.S. Senate. Such developments reflect a country that, evidently to the dismay of many Donald Trump supporters, is changing demographically. To what degree the changes will be felt this November — in statehouses, Congress, and the White House — remains to be seen.